Materials research is very important. An understanding of the properties and uses of materials, will help a designer during almost every stage of the design process and especially during the development section. Initial research can be carried out by a general investigation of materials. A sample can be viewed by clicking on the link below. 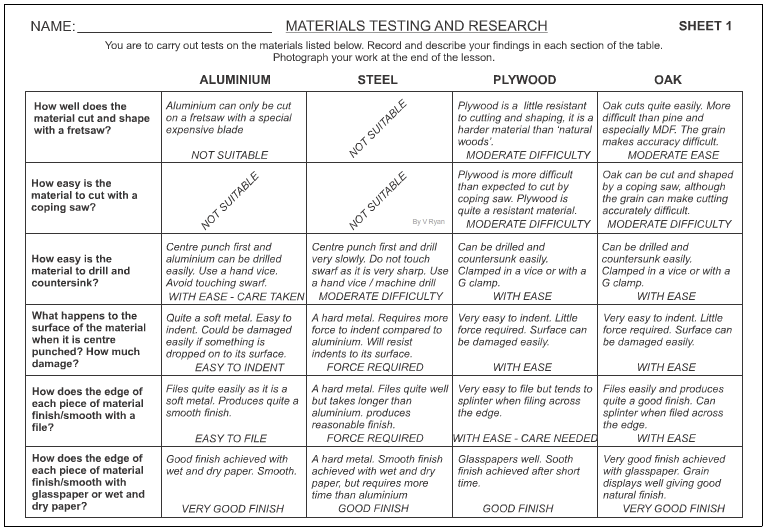 Materials testing is a very important aspect of research. When designing a product, an understanding of the properties of materials will help determine if a material is suitable for the manufacture of a product, including any product you are designing. At some point, there will be a need to test materials yourself, or you may need to rely on the data produced by researchers. How well does the material cut and shape with a fretsaw? How easy is the material to cut with a coping saw? How easy is the material to drill and countersink? What happens to the surface of the material when it is centre punched? How much damage? How does the edge of each piece of material finish/smooth with glasspaper or wet and dry paper? How does the edge of each piece of material finish/smooth with a file? After all the materials tests have been carried out, the test pieces are laid out on a sheet of card / paper.They are labelled and photographed. 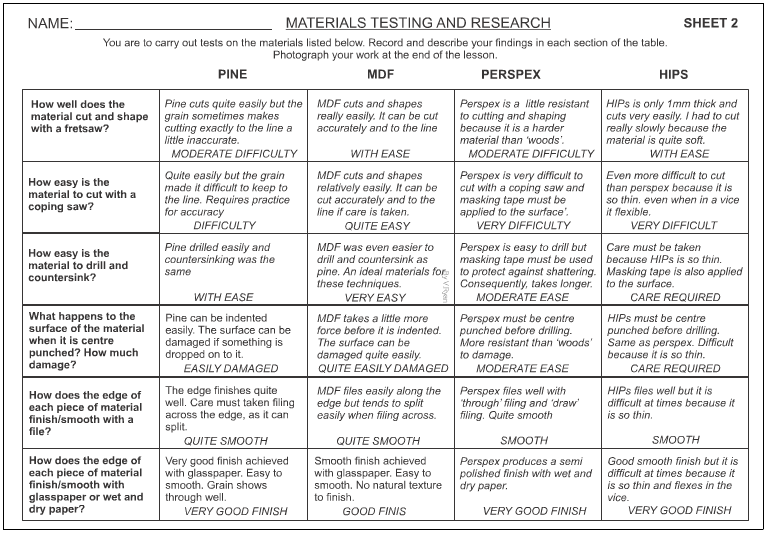 The photograph is then used, along with the materials testing and recording sheets as evidence that genuine tests have been carried out.